A year ago yesterday, the first episode of my Wiki of the Day family of podcasts was published. It was about, well, Load Testing. A few days later, once there were episodes of each of the variants of the podcast, I officially announced that I had launched three new podcasts. Soon after that, the podcasts were included in the Apple podcast directory and we were off to the races. At the 100 day mark, I posted an overview of how it was doing, but I figured now that we are at the one year mark it would be good to look again. 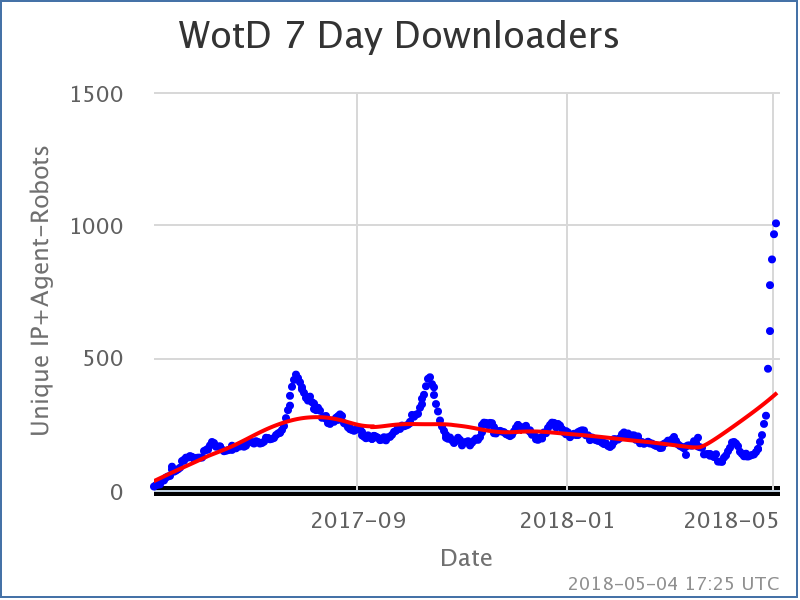 This is looking at unique downloaders in the trailing 7 days for all three variants combined based on IP address and UserAgent, excluding some obvious robots. In the first couple months, downloads went from zero to about 250 a week. After that, aside from spikes, the number slowly declined, so by early this year, it was more like 150 a week usually. There were three big spikes though. The first spike, in July 2017, was driven by the episodes about Chester Bennington and Linkin Park after Bennington’s death. The second spike, in October 2017, was driven by the episode about Tom Petty after his death. The third and biggest spike, which is still in progress as I write, was initially looking like a small bump for the episode about Avicii after his death, but that was then overwhelmed by the article on the Golden State Killer after Joseph James DeAngelo was arrested for those crimes. As I write, that episode has been downloaded 848 times and counting. Also, by pure happenstance, serendipity, and coincidence (I’m practicing my redundancy), on the exact one year anniversary, the three podcasts combined exceeded 1000 unique downloaders in the previous 7 days for the first time ever. Now yes, this is from the Golden State Killer spike, and it will recede soon, but maybe we will have picked up a few long term subscribers who found the podcast through that. We shall see. By comparison, my actual human recorded current events podcast I do with Ivan Bou has been in the range of 150-250 unique downloaders per week over the same time period. Of the Wiki of the Day podcasts, popular gets all the love, because it highlights Wikipedia articles that were at the top of the most viewed Wikipedia page list the day before. So it is topics people are searching for information on anyway. So people search in their podcast players and find these episodes. Now, when they get there, they just get a 2-3 minute quick summary of the topic, not an in depth discussion of the subject, so it is quite possible some of the people who find it are disappointed with what they get. But hopefully at least some folks find it interesting or helpful, and end up subscribing to hear more. They are certainly “different” sorts of podcasts though, and I can understand why it might be an acquired taste. But it was fun to set up, and I at least find them fun to listen to each day, and sometimes I actually learn new things!